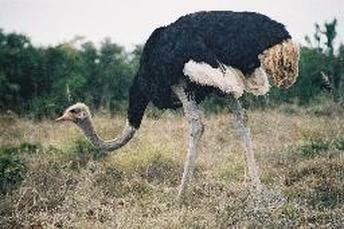 Ostriches are the tallest and heaviest bird..
Do not bury their heads in the sand. Belong to a group of flightless birds known as Ratites. Other Ratites include Kiwis, Cassowaries and Rheas. Have long, strong legs for running. It can run about 40 miles an hour for a short distance. Males can roar like lions. Have a very strong kick. Have two toes on each foot. When in danger, it will lie low to hide, stretching its neck along the ground. Eat grasses, shrubs, seeds, roots, leaves, flowers, locusts and grasshoppers - occasionally, they may eat lizards and mice. Eat small stones and sand to help grind up the food in their digestive system. Don't need to drink as they make their own water internally. Have the largest eyes of any land animal. All the females lay their eggs in the nest of the dominant female. The dominant female's eggs are laid in the centre of the nest which protects them. The nest may have 15-60 eggs in it. Eggs hatch after about 40 days. An egg is as big as 24 chicken eggs. Its egg is bigger than its brain. Its eye is bigger than its brain. It takes an hour to soft-boil an Ostrich egg. It takes an hour and a half to hard boil an Ostrich egg. Live between 30 - 40 years. Can kill a lion with a single blow. An Ostrich could run the London Marathon in 45 minutes. Can be trained to herd sheep. Can live up to 75 years.